Blepharoplasty, or Eyelid lift surgery helps to improve the appearance and function of the eyelids by removing excess skin,commonly called "hooding", remove and smooth the fat pads under the eyes, and treating fine lines and wrinkles under the eyes and on the outer corners. These procedures can result in a more refreshed and rested look, improve peripheral vision, and lessen the feeling of eyestrain. 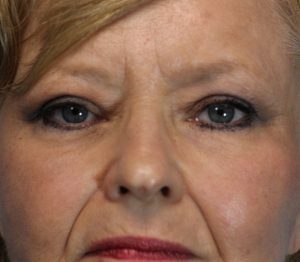 An upper and lower eyelid lift can be done alone or in conjunction with other procedures such as a face lift, brow lift or brow suspension. 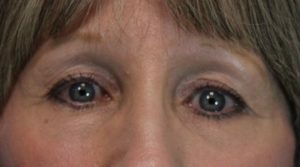 The upper eyelid lift is done by means of an incision in the eyelid crease, allowing for removal of excess skin and fat. The resulting scar is usually difficult to detect. If the forehead and eyebrows are drooping, a brow suspension, or partial forehead lift, is frequently recommended when having eyelid surgery. A laser treatment to treat the wrinkles of the lower eyelid and the outer corner of the eye can also help to get rid of that "tired" look. As we age we loss the youthful volume in the face and around the eyes. With the use of your own fat we can add volume back to theses areas. Other "off the shelf" products, such as Juvederm, is also an option. After Eyelid surgery with Face lift and Laser. 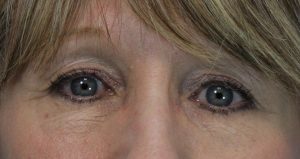 The Lower eyelid lift is done using the the newest techniques.The surgery can usually be done from the inside of the lower eyelid, or the transconjunctival approach. The Smart Lipo laser is used to help dissolve and smooth the fat pads. This approach avoids any skin incisions and any visible scar. The procedure takes one and a half to two hours and can be done with local anesthetic, avoiding the problems with general anesthesia. Before Lower eye lid surgery. After fat removal of lower eye lid. 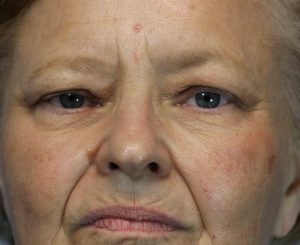 Skin wrinkles of the lower eyelid. Wrinkles under the eyes are generally caused by aging of the skin. 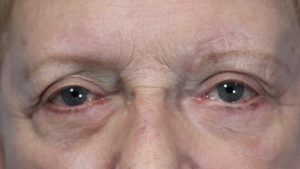 Removing a lot of lower eyelid skin is generally not very effective. However, eyelid surgery and laser resurfacing can help soften lower eye lid wrinkles. When there are both lower lid “bags” and wrinkles, the surgery for the bags and the laser treatment for the wrinkles can be performed at the same time. Bruising and swelling are to be expected but there is very little pain. There may be some blurring of vision, due to the use of ointment, or some drying of the eyes. These effects usually disappear rather quickly. Most people can drive within 2-5 days after surgery, and most patients are able to return to work in 3-10 days, depending on their healing and type of work. Normal exercise routine can be resumed in about two weeks. Wrinkles under lower eyelid before laser treatment. Post lower eyelid Laser Treatment.